Song of a Columbian Trig (scroll down for explanation and additional recordings!). With its bright golden back, translucent green body, and eyes ranging from brilliant red to mottled brown, the Columbian Trig is quite stunning in appearance. 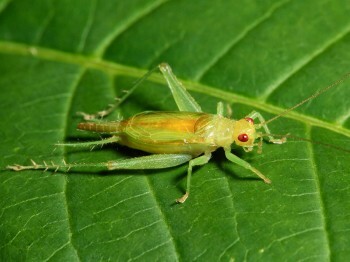 Less than a half-inch long, individuals can be extremely difficult to locate, and a hand lens is required to see their unique beauty. Bradford pear trees as well as crepe myrtle are favorite plants. Large colonies can often be found in one tree or bush while neighboring trees of the same species are empty. One way to collect Columbian Trigs is to place a sheet below a tree where they have been heard singing, then shake limbs and look for trigs that fall onto the sheet. Song: A delightful, pulsating series of musical chirps that can be heard only from close by. Males in a colony roughly synchronize their songs, creating a steady, musical throb, reminiscent of distant sleigh bells. Each chirp is composed of about 5 pulses, given at a frequency of 7 kHz. Sonogram of a Columbian Trig. © Wil Hershberger.